Life for George wasn’t as easy as being a goldfish. The 10-year old goldfish, apart from being bullied by fellow fishes was suffering from tumour that caused him immense pain in the head. On the 16th of September 2014, George was in Australia undergoing a high risk brain surgery – an operation termed as “fiddly” by expert veterinarians. The owner of the goldfish had two options to treat the tumour protruding from George’s head – to have it operated or to have it put to sleep, permanently. 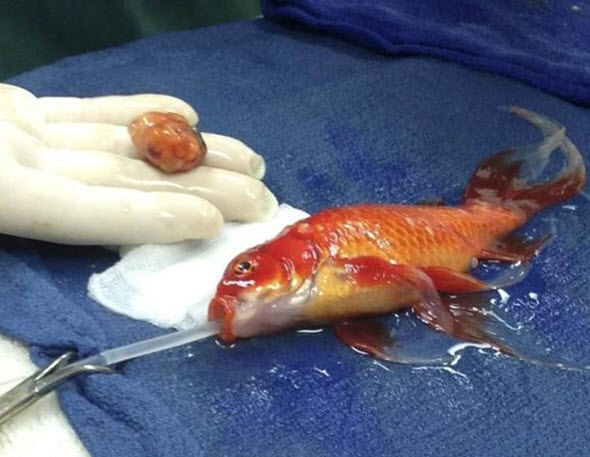 The Melbourne-based owner decided to go for the surgery to save her goldfish pet. Tristan Rich, the vet who carried the operation from the Lort Smith Animal Hospital stated that the owner was dedicated enough to give it a try. For the 30-minute procedure, George was knocked out with anaesthetic, and according to Tristan, George is recovering well back in his home pond. Tristan was quoted stating, “It was quite fiddly as you can imagine and you have to control any blood loss. You can only lose half a millilitre. Obviously it was high-risk but everything went well in the end.” Tristan also mentioned having done similar operations on goldfishes that had lived till they were 30 years old. Tristan mentioned, “The owner was quite attached to him. Everyone forms bonds to pets in different ways and it is not up to us to distinguish between species.” The owner was so dedicated to George that she didn’t care about spending thrice as much as it would have cost her to just buy a new goldfish. According to some sources, the procedure involved setting up numerous buckets with different levels of anaesthetics. A tube was inserted in George’s mouth, which pumped sufficient amount of water with smaller dosage of anaesthetic. Using a medical tool, Tristan removed a large tumour from George’s head and also used a special medical sponge to control the bleeding. After it was over, George’s head was closed with a few stitches or thread and tissue glue. Soon after the surgery, George was placed in the recovery unit, given oxygen, pain relief injections as well as antibiotics to help him recover soon. But soon after, the fish took a couple of breath and was back swimming in no time! Over the course of the year, the tumour had grown so much in size that George had a difficult time eating, getting around and was also being bullied by other fish in the pond.